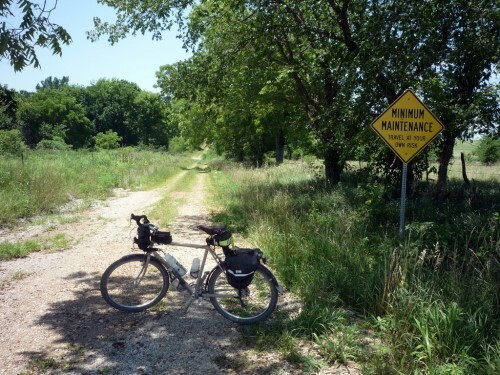 Southeastern Franklin County, Kansas boasts a good number of minimum-maintenance roads. I’ve ridden them all before, but never all on the same ride. It’s been a while since I’ve gotten out on a good ramble, and even though the forecast was for nearly 100 degrees of heat, I headed down to Rantoul for a bit of exploration. 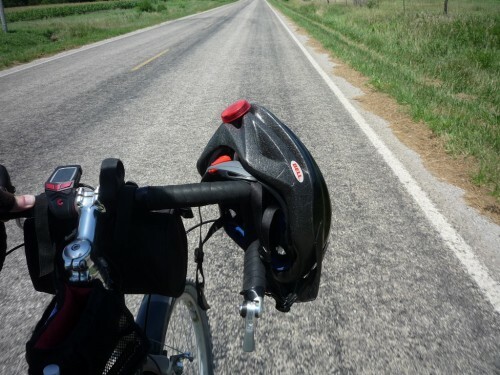 Virginia Road heading south out of Rantoul has a couple of really fun, tough hills that I always enjoy. I usually take a left at John Brown Highway, but this time I kept going on Virginia Road for another half mile, until it turned west and became John Brown Drive. This turned out to be a really nice little road — well-shaded, with several nice curves. From there it was onto Vermont Road for a mile (a paved road) before hitting gravel again. I ran into a minimum maintenance road at Finney Rd and Utah Rd, but my mapped route led south, so elected to stay with the plan. I’ll have to go back and check out that MMR another day. That’s signed as a minimum maintenance road, but it didn’t look passable, and I didn’t want to do any hike-a-bike in the woods. The shade would have felt nice, but with no wind it would have been stifling. I took Ellis Terrace west to Texas Road, then south to Douglas Road. This was my first time on this road, and it’s a fun one as well, with some nice dips and twists. I always love it when I see the “Curves Ahead” sign! After Douglas Road it was back onto pavement for about a mile, before heading south on gravel again. As soon as I turned onto Utah Road, I was passed by three vehicles — two pickups and a kid on an ATV — coating me in a fine limestone dust. I think those were the only times I was passed for the entire ride, and they all happened at one time. Weird. 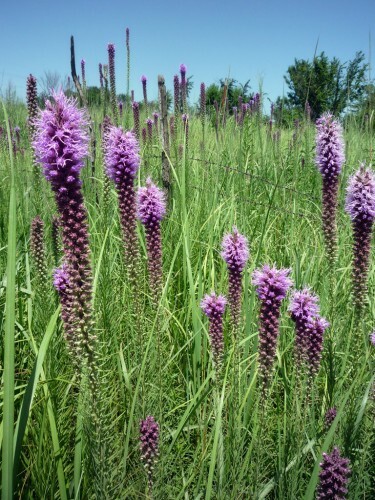 Thickspike Gayfeather, also known as the “Prairie Blazing Star”, and amazingly enough, a member of the sunflower family. 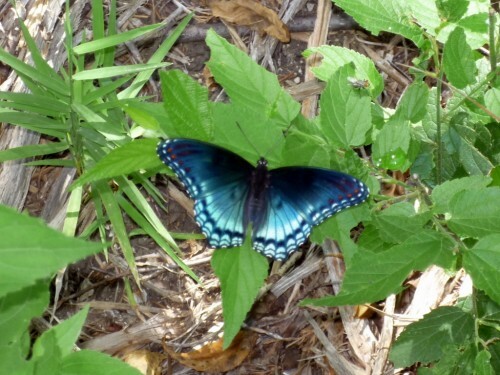 This is a “Red-Spotted Purple” butterfly (Limenitis arthemis astyanax). I saw quite a lot of these along the route. Very pretty. This one was kind enough to sit still for a photo. After that it was time for a nice stretch of minimum maintenance road — first on Texas Road, from Butler Terrace to Cloud Road. 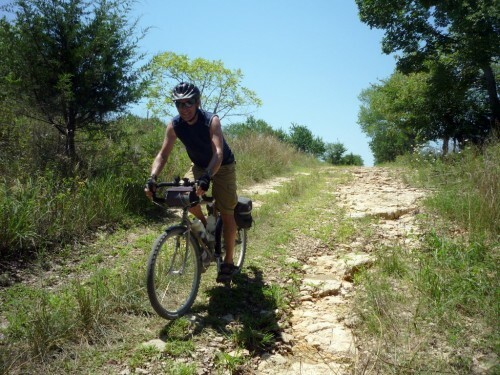 This road starts off tamely enough, running along a ridge top that feels very open and rolling, like the Flint Hills. But then it drops into a creek valley, with a very rough and rocky curving downhill that always feels a little scary and on the verge of being out of control. This time though was especially so, since a road grader had recently come through, making the surface loose and treacherous. This is the start of the downhill — just past the curve the road drops sharply. Lots of big, loose rocks to navigate around, with soft sections mixed in. I made it to the bottom without crashing, but it was touch-and-go for a bit! The next MMR section was Tennessee Road, followed by Douglas Road. 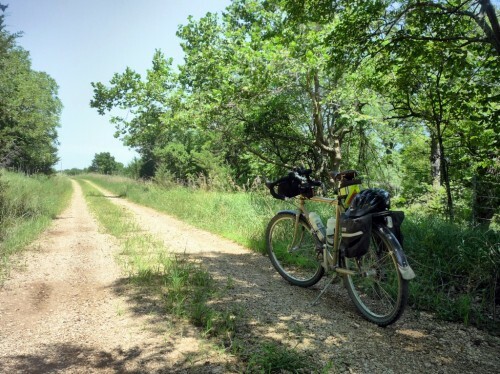 Tennessee Road follows alongside the north fork of Sac Branch Creek, and it’s tree-lined for most of its length, with some big rocks on a couple of short ups and downs. At the northern end of the road is a nice little pond that always makes me wish I’d brought fishing gear, just to give it a few casts and see what happens. 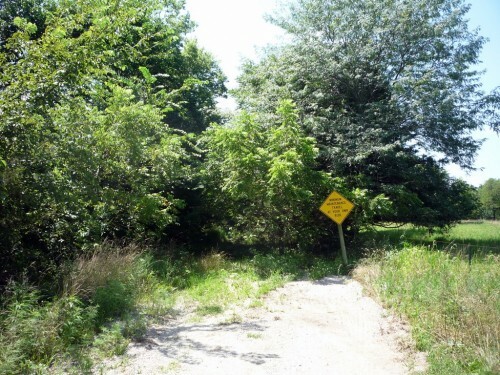 Here’s the entrance to Douglas Road … it looks easy enough. 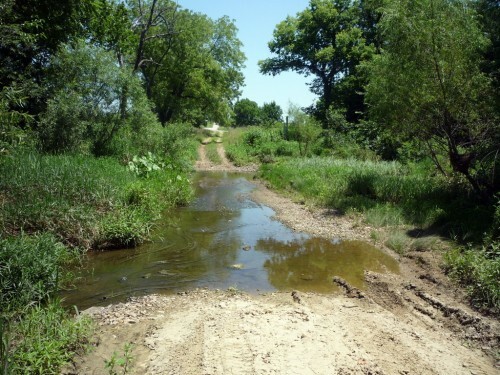 But then there’s a low-water crossing at the bottom of the first hill (the north fork of Sac Branch Creek again). I’ve been through here several times. Once I was able to ride through. Once the water was up and the weather was cold, so I turned back. On this trip the water was up a bit, but not too bad. Too much for me to want to ride through, but I carried the bike across the deepest section, and walked it around the rest. The water felt nice! Following the creek there’s a sharp, rocky rise, and I set up there for some riding shots. This was the best of the bunch. The photo doesn’t really do the scene justice — the road is much rougher than it looks here. And it was hard to get the photos — only 10 seconds to press the shutter, run to the bike, climb on, and start pedaling! I’m generally a big advocate for helmets, but on this ride, 98°F with full sunshine, a black helmet wasn’t the best choice. It felt much better after I took it off! I made it back to Rantoul for just over 31 miles. On a hot day, that was enough. But dang, I enjoy riding this area! I enjoy riding bicycles all over -- city streets, suburbia, rural roads, gravel roads, dirt roads, rail-trails, and singletrack. 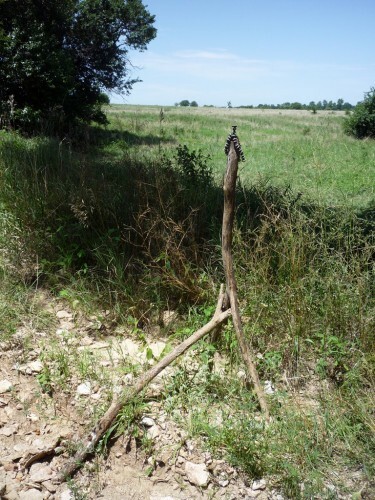 I love exploring the countryside and finding the interesting and historical treasures hidden in plain sight. You can follow my rides on Strava. Looks beautiful! 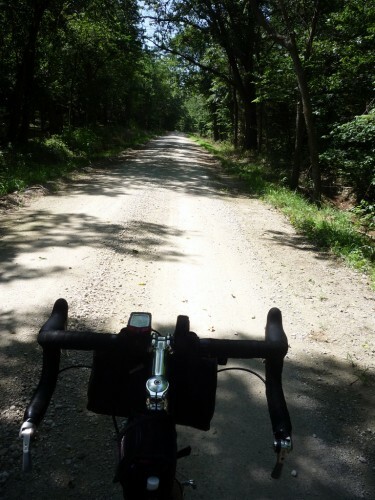 Man, I’m itching to hit some gravel now. That shot of the gayfeather is spectacular, as are the roads. 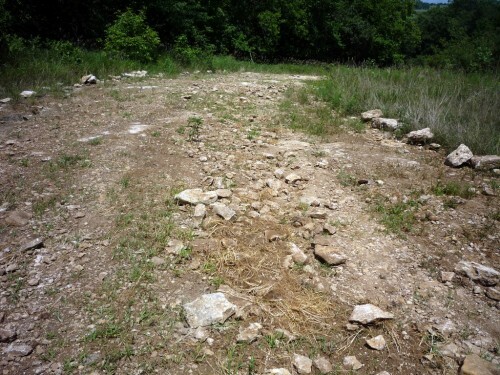 I haven’t had my gravel fill in a few months and am dying to get some Fall time mixed-terrain in, just like Apertome. Thanks for sharing about your ride! Looks like a nice rural escape. 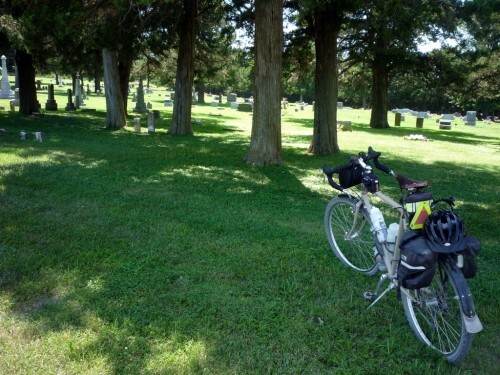 I have some bike trip photos coming up on my blog soon (up in Canada)… Interesting to see what it’s like further south. I’m going here in a few.